Motorola One could be the first Motorola phone powered by a Samsung chipset. A new leak suggests an upcoming Motorola-branded smartphone supposedly called Motorola One Vision and the surprise is that it could be powered by a Samsung Exynos SoC. The listing reveals specs that are indicative of Samsung's 10nm Exynos 9610 chipset. This aligns with the earlier rumours that Motorola will launch two smartphones that will be powered by Samsung's Exynos 9610 chipset. 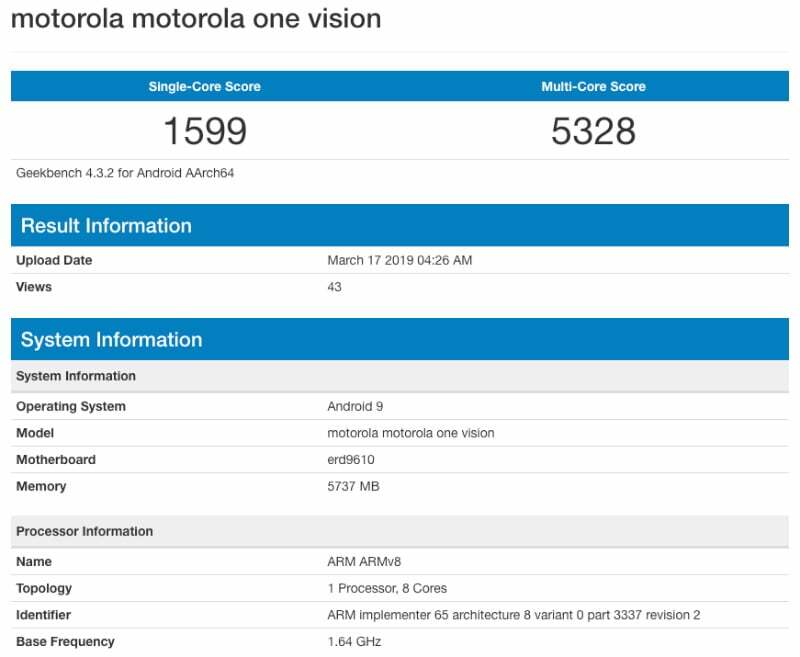 The alleged Motorola One Vision listing further tips that the phone will come with 6GB of RAM and Android 9 Pie out-of-the-box. The Geekbench listing shows the smartphone as an octa-core ARM processor with a base frequency of 1.64GHz, 5737MB of RAM and Android 9. Motorola One Vision seems to be the suggested name for the upcoming smartphone, which is a yet to be formally announced model. The model was evidently tested as recently as March 17. A report from MySmartPrice points out that Motorola may in fact be launching two phones featuring the Samsung Exynos 9610 SoC — Motorola One Vision and Moto P40. The latter is said to come with a hole-punch front camera and a dual-rear camera with a 48 megapixel primary sensor. The report also suggests that both Motorola One Vision and Moto P40 may end up being the same device, as there's very little known about either of them. Aside from this Motorola is also said to be working on the return of the Moto Razr in a new foldable-display avatar, which we have been covering in leaks for a while now. This however, looks like it may end up using a Snapdragon 710 SoC, rather than an option from Samsung's lineup.